I believe in passive measures to ventilate attics, but I bought a solar powered fan to try out an idea. Last summer seemed to be bad for my air conditioning system. I do not know if this was perception or not, but I did end up having repairs made to my unit. Passive ventilation means that you have no mechanical (active) way to create air flow in the attic. I like passive methods for two reasons: 1) they do not break down, because there are no parts; and 2) they do not use energy. Sure a fan in the attic might not use a great deal of energy compared to the air conditioning unit, but every small thing adds up. That is when I came across a solar powered attic ventilation fan. This fan meets a goal that I have. I do not want to add features to my home which will use up more energy, but specifically energy from my utility company. In fact, I plan purchases based on the idea that they will use the same or decrease my energy consumption. Solar is great for me, because even though I am increasing my energy usage, the power is not coming from utility company. I found a attic fan at my local home improvement center for a little over $200, and it is not that hard to install. There are two basic fan designs for attics. They depend upon your roof design. Roofs with gable ends have vents at each end which bring the air through the attic space. Roofs without gables will have vents in the soffits then another vent at the ridge of the roof or in the field of the roof. On gable ends, you can find a attic fan that pulls air from the attic to drive it outside. This causes air to be pulled in from the other vent. In non-gable end roofs, attic vent fans are placed in the field of the roof towards the ridge. These units are hard to install, since you have to cut a hole in your roof, shingle around the unit, and ensure that you have taken other steps to prevent moisture penetration. 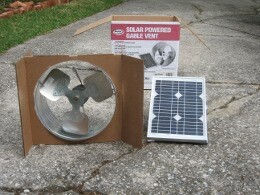 I do not have a gable end on my home, but I bought the solar powered fan that fits into a gable end. I have enough ventilation, but during a hot summer, it does not feel like enough. My air conditioning unit is in the attic. This sets up the situation where my conditioned air can be effected by this heat. I have my radiant barrier, which does reduce the heat; however attics are never reasonable in a Houston summer. I have done as much as I can with insulation. Short of building an air conditioned room in my attic for the HVAC system, I am at a stopping point for normal ways to handle the attic. My idea to help me go a step further is to create air flow over the unit. I am setting up the attic fan to blow air not out of the home directly, but in the framing near the evaporator coil. The evaporator coil has the pan underneath it. This is the unit where the cooling of the air occurs. The fan will blow air on the exterior of the coil housing, and then will exit the building through my ridge vent. The solar panel will be attached to the roof much like a dish for the television, or at least as the dish should be attached. Most dish installers do not caulk the screw heads holding the mounting bracket. I will make sure that these will not be potential leak spots. The other factor will be the cable supplying power from the panel fan. Dish installers and cable television leave their cables lying on the roof. Good ones will secure these cables, which is fine. I will be taking the cable through the roof covering, so I will want to take steps to prevent moisture entry at this point. I am going to drill my hole under the shingle, and I will caulk it. In theory, more air flow will be a benefit to the attic. My set up will not be typical. I am not sure if this will have a great effect on the air conditioning. I will need a follow up post showing my results. Currently, I am not cooling my home. Open windows and ceiling fans have dealt with the minor heat so far this year. My desire is that I will not need to turn on the air conditioning until summer; we managed to do that last year. Maybe this solar attic ventilation fan will help. Update: I had to build a frame to hold the unit in place. The installation of the solar panel on the roof was easier. I did drill a 5/8″ hole underneath a shingle This was a little larger than what I wanted to do, but that was the size needed to have the connector at the end of the wire go through. After the equipment was affixed, I only had to plug the connectors together. The fan comes on when the sun hits the panel. There is a bit of a noise, which is not always obvious. No one has been disturbed by that whine in the home though, so everything is fine. I am still not running my AC (the weather has been too nice). I have been working in the attic to prevent thermal bridging by adding more insulation, and the temperature has not been too bad. This entry was posted on Tuesday, April 6th, 2010 at 11:35 am	and is filed under Green home conversion. You can follow any responses to this entry through the RSS 2.0 feed. Thank you for your article. It’s good to read something related to solar power that actually makes sense. I’m going to bookmark your site and come back to it.